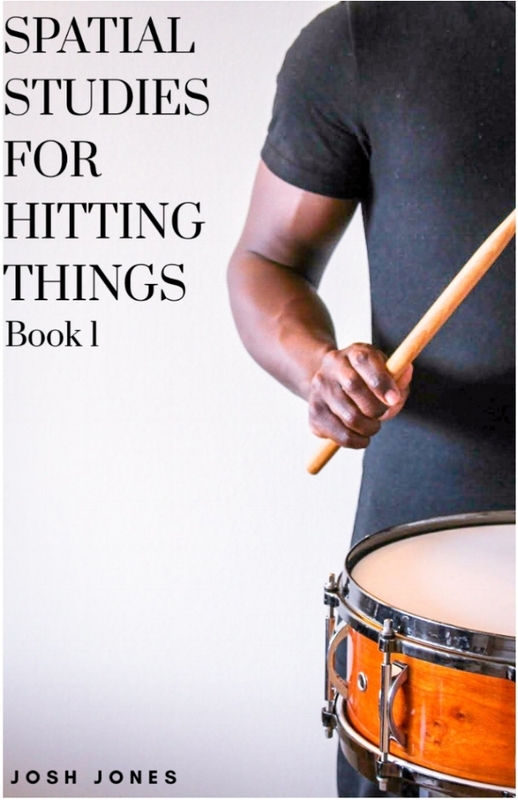 As a student, I became increasingly fascinated with the physicality of playing percussion. This led me to study different disciplines outside of music, such as martial arts, meditation and tai chi, and other methods of movement. However, with all of the extended study I did, I was always left wanting in some way. It wasn’t until I performed for a modern dance class that I heard the phrase that essentially unlocked what I was missing, or rather was unable to understand, from all of my previous research: “Take space.” The instructor, Lin Batsheva Khan, encouraged the class to expand their reach, increase the distance they ran in, exaggerate their movements, manipulate the time it took to complete a task or movement, to “take” more space. After that, I began to see drumming as if I was a dancer. Not only did this emphasize and encourage graceful, efficient movements, but also an increased attention to the space that that movement moves through. Soon I had even more questions. How much time does it take to get from A to B? What about the space between beats? Is the movement heavy or soft? How does that affect the sound? How does my sound take up space? I eventually categorized these questions into different types of space. Having these categories allowed me to apply everything I had researched and created exercises, meditations and different ways of thinking in order to develop a technical structure that met and exceeded my aspirations. This book series focuses on exploring and establishing an awareness of all types of space, building a technical structure that is completely natural, relaxed, flexible and adaptable. The initial process towards this technique will be explained in detail through both guided and freeform exercises throughout this introductory section. Instantly reaching a relaxed state takes a complete knowledge of one’s body: how it moves, how it reacts to different stimuli, and what the body feels like when it is or isn’t relaxed. When developing any technique, beginning at a place of relaxation is crucial to ensuring that you are learning and executing the technique correctly, creating good habits. I also believe that the physical aspects of a relaxed technique are only as good as the mental aspects behind them. Discovering those connections between how we think before, during, and after we execute a movement is both enlightening, and helpful when making any changes to the technical structure. My goal in writing this book is to give guidelines for exploring these concepts of relaxation through both standard and extended technical exercises that could appear in any repertoire. While this book primarily focuses on technical development, it should not be the only driving force for whoever uses it. My original goal was to create exercises that would help me develop the ability to express myself, whether it was a new solo, improvisations, or just jamming with friends. The more I could physically do, the more freedom I felt while performing. While going through this book, remember that technique is only a means to an end. This book will take you through a similar system that I used to fully explore the concept of relaxation, through the basic techniques, and through ways of thinking in order to facilitate a calm and alert mind. Solidifying this relaxed technical structure is key before attempting any other techniques that add necessary tension within the body and mind (be it hands, fingers, increased focus or thought activity, etc). To begin this process, we must first establish what complete relaxation means for us as individuals. From there, learning how to move in a relaxed and fluid way is crucial to maintaining this relaxed state. Find the path of least resistance and execute tasks in the simplest way possible. Often, that will be the best option.